1999 equipment built to the original standard. This paper explains the latest advance in Wi-Fi, 802.11ac, which provides the next step forward in performance. The current state-of-the-art Wi-Fi is known as Wi-Fi CERTIFIED n or 802.11n. In the four years since the Wi-Fi Alliance introduced its initial certification, this technology has become hugely popular. 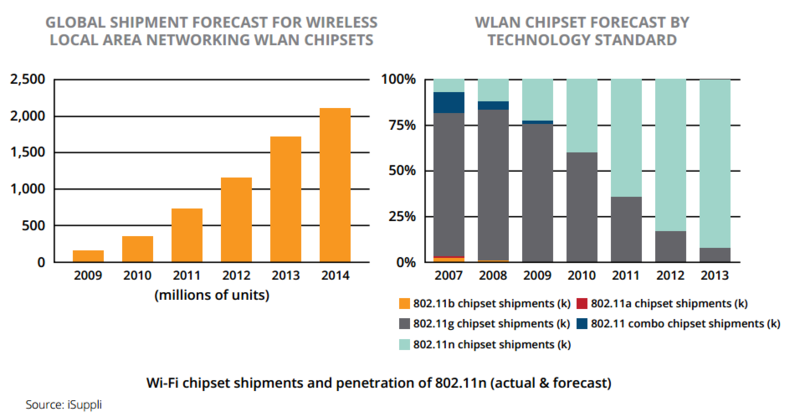 According to IHS iSuppli, 802.11n now accounts for over two-thirds of Wi-Fi chipset shipments, and is on track to take over completely from 802.11a/b/g in mainstream applications before the end of 2012.
primary edge connection for corporate networks. The current generation of 802.11ac Wave 1 products, that have been certified by the Wi-Fi Alliance since mid 2013, deliver a three-fold increase in performance. This is driven by a doubling of channel bandwidth to 80 MHz, addition of a more efficient 256-QAM encoding technique and explicit transmit beamforming to improve signal quality. data service access point), of at least 500 Mbps. input/multiple output (MIMO) for parallel delivery of multiple spatial streams. Most of the features extend the limits of 802.11n, adding more antennas, more spatial streams, wider RF channels and higher-level coding. New mechanisms are also defined, notably multi-user MIMO where an access point (AP) transmits simultaneously to multiple clients. • The amount of bandwidth in a cell will increase, allowing a single AP to serve the same number of clients with greater per-client throughput. Even though 802.11n throughput routinely exceeds 100 Mbps per client, some corporate use-cases such as server connections require higher bandwidth, and 802.11ac will further squeeze the number of corner-cases where IT goes wired-because-we-must rather than wireless-where-we-can. • Alternatively, a single AP will be capable of serving more clients with the same throughput. This is typically important in dense-client scenarios such as lecture theaters and conference centers, where huge numbers of clients must be served. Consider a company event where employees can follow along with live video, audio and slide feeds whether they are seated in the back of the auditorium or at their desks. • 80-MHz channels are two adjacent 40-MHz channels but with tones (subchannels) in the middle filled in. • 160-MHz channels are defined as two 80-MHz channels. The two 80-MHz channels may be contiguous or non-contiguous. Enterprises will be able to utilize the 80 MHz channels but the future optional 160 MHz channel support will only be usable in home environments since there are only 1 (or 2 if DFS is enabled) 160 MHz channels available for designing an enterprise deployment while the use of 80 MHz channels can leverage up to 5 channels in the deployment plan. to date few chips and APs using more than three streams. 802.11ac retains support of three spatial streams in todays products but allows for future support of up to eight spatial streams. There will be a number of consequences. A divergence between chips and equipment for APs (with four+antennas) and clients (typically with < four antennas) will occur due to cost, physical size and power constraints. APs will grow by adding antennas, while clients will become more capable by implementing multiple spatial streams and beamforming features behind a smaller number of antennas. four spatial streams (with four antennas), this is most likely to benefit when combined with future MU-MIMO support. targeted clients simultaneously. This is a good way to make use of the expected surplus of antennas at APs over clients, and it requires beamforming techniques to steer signal maxima over the desired clients while minimizing the interference caused at other clients. • Space Division Multiple Access (SDMA): A term for streams not separated by frequency or time, but instead resolved in space like 802.11n-style MIMO. • Downlink MU-MIMO where the AP transmits simultaneously to multiple receiving devices is an optional mode. take time for a large number of clients to become available and deployed. time with the leap from 64-quadrature amplitude modulation (QAM) to 256-QAM. • 256-QAM, rate 3/4 and 5/6 are added as optional modes. For the basic case of one spatial stream in a 20 MHz channel, this extends the previous highest rate of 802.11n from 65 Mbps (long guard interval) to 78 Mbps and 86.7 Mbps respectively, a 20% and 33% improvement. (Note that 802.11ac does not offer every rate option for every MIMO combination). Below is a summary of additional elements and features. • Single sounding and feedback method for beamforming (vs. multiple in 11n). This should enable inter-vendor beamforming to work with 802.11ac devices; the diversity of optional feedback formats in 802.11n resulted in differing implementations and stifled adoption. • Coexistence mechanisms for 20-, 40-, 80- and 160-MHz channels, 11ac and 11a/n devices. Extensions of 802.11n techniques to ensure that an 802.11ac device is a good neighbor to older 802.11a/n equipment. • Non-HT duplicate mode duplicates a 20-MHz non-HT (non-802.11n) transmission in four adjacent 20-MHz channels or two sets of four adjacent 20-MHz channels. Whenever there’s a new 802.11 standard, most of IT organizations want to know “How fast?” With 802.11n the answer becomes quite complicated, because there are many options and some types of devices, such as smartphone, will be restricted to a fraction of the theoretical full speed because of practical limits of space, cost and power consumption. The tables below offer some useful figures. and 7.2 Mbps for short guard interval, and up to 65 Mbps and 72.2 Mbps the rates are identical to 802.11n. The MCS 8 and MCS 9 rates are new and enabled by advances in chip technology. MCS 9 is not applicable to all channel width/spatial stream combinations. power requirements and limited frequency available for use. performance bottlenecks or an overload in client density then now is the time to look towards deploying 802.11ac. (57-63 GHz) with the 802.11ad amendment. This table is from the IEEE 802.11ac draft rather than the Wi-Fi Alliance. Vendors will follow the latter’s guidance on mandatory and optional features, but the table above represents a good preview of the Wi-Fi Alliance’s probable classification. channel width from 40 MHz in 802.11n to 80 and 160 MHz. This allows a pro-rata increase in effective data rates. However, since the spectrum allocated for Wi-Fi is limited, it has been necessary to allow for channels to be split across non-contiguous spectrum. The diagram below shows how the available 5-GHz bands are used for various channel widths. In the United States, Wi-Fi uses three blocks of spectrum between 5 and 6 GHz. The U-NII 1 band is restricted to indoor operations, the U-NII 2 and U-NII 2 extended bands are for indoor and outdoor operations, and the U-NII 3/ISM band is intended for outdoor bridge products and may be used for indoor WLANs as well. MHz, an increment of four for the channel number indicates adjacent 20 MHz channels. The band from Channel 36 (center frequency 5,180 MHz) to Channel 48 (5,240 MHz) is known as U-NII 1, while channels 52 (5,260 MHz) to 64 (5,320 MHz) comprise U-NII 2. Both are available for Wi-Fi, and they can be used for two 80-MHz channels or a single 160-MHz channel. Since the U-NII 1 and 2 bands have different FCC rules for antennas and transmit power, the more restrictive rule would apply to a 160-MHz channel spanning both bands. The band from Channel 100 (center frequency 5,500 MHz) to Channel 144 (5,720 MHz), known as U-NII 2 extended or U-NII-2 Worldwide, is a little wider, and since Channel 144 is now allowed for 802.11ac, it can support three 80-MHz channels or one continuous 160-MHz channel. 36-48 and 116-128 comprise a viable 160-MHz channel, sometimes referred to as 80+80 MHz. But each of the underlying 80-MHz channels must be contiguous. equipment using channels from 5,250 to 5,725 MHz must be certified for DFS. a less significant restriction: The Wi-Fi Alliance has some work under way with the goal of decreasing the number of non-DFS 5-GHz devices. available, even to DFS equipment. In terms of usable bandwidth, the increase in channel width delivers slightly more than pro-rata because the ratios of pilot and DC tones to subcarriers decrease. The diagram shows that moving from 20 to 40 and 80 MHz increases usable subcarriers by 108/52 (x2.07) and 234/52 (x4.50) respectively over the 20-MHz 802.11n standard. The 160-MHz channel is always treated as two 80-MHz channels for subcarrier assignment, whether contiguous or not. The Wi-Fi Alliance will certify devices to a selected subset of 802.11ac criteria, and we don’t yet know the details of that subset but the current IEEE amendment states that 80-MHz channel capability is required, while 160-MHz channels are optional. Since 802.11ac realizes most of its gains by extending techniques that were pioneered in 802.11n, it is appropriate to briefly cover these techniques. The breakthrough technology of 802.11n, achieving its most dramatic improvements in data rate, was the use of MIMO (multiple input/multiple output) spatial division multiplexing. SDM requires MIMO, specifically the transmitting and receiving stations must each have multiple RF chains with multiple antennas – it does not work where either station has only a single antenna chain. Each antenna is connected to its own RF chain for transmit and receive. The baseband processing on the transmit side can synthesize different signals to send to each antenna, while at the receiver the signals from different antennas can be decoded individually. Although practical systems will transmit in both direction, this explanation is simplified by showing only one direction of transmission. Under normal, line of sight conditions, the receiving antennas all hear the same signal from the transmitter. Even if the receiver uses sophisticated techniques to separate the signals heard at antennas 1 and 2, it is left with the same data. If the transmitter attempts to send different signals to antennas A and B, those signals will arrive simultaneously at the receiver, and will effectively interfere with each other. and the upper bound on performance is a clear-channel single-stream. However, if there is sufficient RF distortion and especially multipath in the path, receiving antennas will see different signals from each transmit antenna. The transmit antenna radiates a signal over a broad arc, scattering and reflecting off various objects in the surrounding area. Each reflection entails a loss of signal power and a phase shift, and the longer the reflected path, the more delay is introduced relative to a line-of-sight signal. In the past, multipath was the enemy of radio systems, as the receiver saw a dominant signal (usually line of sight), and all the multipath signals tend to interfere with this dominant signal, effectively acting as noise or interference and reducing the overall throughput of the system. To understand how MIMO works, first consider the signal each receive antenna sees in a multipath environment. In the diagram above, antenna 1 receives signals from the transmitter’s antenna A (two paths) and antenna B. If the signal from antenna B is the highest-power, the receiver can choose to decode that signal. MIMO it can be used constructively. Line of sight normally gives the best performance, but with MIMO it provides just baseline data rates. The diagrams below show the different techniques that can be used with MIMO in an 802.11n and 802.11ac system, when the client has a multiple antennas or a single antenna. In the following section we will briefly explain each technique. all transmit antennas simultaneously is much less than with a single transmit antenna – so the probability of signal dropouts is reduced. returned to the beamformer and used to weight the signals to each antenna. If the correct weightings of amplitude and phase are chosen, the signal strength at the receive antennas is maximized in a local peak, which maximizes SNR and hence the sustainable link rate. TxBF can be thought of as directing a beam on a particular receive antenna, but there is no flashlight-like focused beam for 802.11n or 802.11ac devices, as one might expect from a high-gain directional antenna: the broader pattern is likely to be a patchwork rather than a beam. SDM was first introduced with 802.11n, and the term SDMA is used now that we have multi-user MIMO (MU-MIMO) in 802.11ac. SDM exploits multipath, where more than one independent RF path exists between a pair of devices. In its simplest form, the transmitter divides the data stream into two spatial streams and directs each spatial stream to a different antenna. Experience with 802.11n has shown that SDM-friendly multipath is present surprisingly often in indoor WLANs. While transmit pre-weighting can improve SDM, current 802.11 chips use implicit feedback and match spatial streams to antennas with a simple algorithm, rather than taking explicit feedback from the receiver into account. STBC is a technique where a pair of transmit antennas is used to transmit a known sequence of variants of the original OFDM symbol. If the receiver knows the sequence, it can use probabilistic methods to correct decoding errors, improving effective SNR for a given channel. STBC can be used where the transmitting device has more antennas than the receiver. Although it is a powerful technique on paper, STBC is only just appearing in the newer 802.11n chipsets. Where multiple receive antennas see the same spatial stream, their signals can be intelligently combined to improve the effective SNR. This is MRC, and it is employed where the number of receive antennas is greater than the number of spatial streams. MRC requires no coordination between transmitter and receiver, it is an internal technique used by the receiver. Most current 802.11n chips use MRC. Where 802.11n specified up to four spatial streams for MIMO, 802.11ac extends this to eight streams. The technique is unchanged, but the matrices for calculations become larger, as do the access points – there can be no more spatial streams than the number of transmitting or receiving antennas (whichever is smaller), so full 8SS performance will only be possible where both devices have eight antennas. Without innovative antenna designs, this probably precludes handheld devices, but access points, set top boxes and the like will certainly be able to use multiple streams. As with wider channels, adding spatial streams increases throughput proportionally. Assuming multipath conditions are favorable, two streams offer double the throughput of a single stream, and eight streams increase throughput eight-fold. antenna, allowing the receiver to construct the matrix for how each of receive antenna hears each transmit antenna. This information is then sent back to the transmitter, allowing it to invert the matrix and use the optimum amplitude-phase settings for best reception. With a single antenna receiver, this results in a local maximum for SNR, for effective beamforming. Sounding frames are important for several MIMO techniques, as they enable ‘channel state information’ (CSI) at the transmitter. CSI (or CSI-T) is a very important concept in MIMO, and it is worth a few lines of explanation. The most important MIMO technique of 802.11n is spatial division multiplexing (SDM), a technique where the receiver needs to know how its receive antennas hear the various transmit signals from the transmitter. For example, if the receiver knows that it hears the transmitter’s antenna A signal at 100% power on its antenna 1, and at 20% power on its antenna 2, it can subtract the 20% signal at antenna 2 and recover other signals with that antenna. This is relatively easy because each frame starts with a preamble that isolates transmit signals from each antenna in turn. By analyzing the reception of the long training fields (LTFs) in the preamble of each frame, the receiver builds a model for the state of the channel at that instant, a model that it then uses for subsequent symbols in the frame. The received LTFs provide channel state information at the receiver (CSI-R). Receiver CSI is very useful, but we can do better. If the transmitter knows how its signals are received by its target in sufficient detail, it can pre-code the signal to each antenna to achieve the very best throughput and lowest error rate the channel will support. In 802.11ac this is used for beamforming, where multiple antennas are used to beam a signal onto the receiver’s antenna, and also for DL MU-MIMO, where it sets up transmissions to steer local maxima to the desired client, and minimums to other clients. medium, and the transmitter and receiver must agree on the data and format of such feedback. The full matrix would indicate amplitude and phase for each transmit antenna, receive antenna, and each OFDM subcarrier in the RF channel – a large amount of data. Therefore various shortcuts have been developed so a smaller amount of information can be fed back without compromising beamforming accuracy. 802.11n includes two methods for achieving CSI at the transmitter. Implicit beamforming allowed the receiver, or beamformee, to send a sounding frame back to the beamformer. The beamformer, on receiving the sounding frame, processed it and used the information under the assumption that the RF channel is reciprocal – knowing how transmit antenna A’s signal is received at antenna B, implies that antenna B’s transmissions would be received at antenna A in the same way. but when A transmits, its transmit chain and B’s receive chain effects that affect the calibration differences and nonlinearities cannot be measured. Thus, while implicit CSI feedback for beamforming is relatively easy to obtain, it is not very accurate. In 802.11ac, implicit feedback is dropped in favor of explicit feedback. Here the beamformer transmits a sounding frame and the beamformee analyses how it receives the frame, compresses the results to a manageable size and transmits them back to the beamformer. This provides accurate channel state information, but requires a protocol for coordination. beamforming with explicit feedback is not generally a feature of current 802.11n equipment. To avoid this situation, only one feedback mechanism, explicit feedback with the compressed V matrix is specified in 802.11ac. The full sounding sequence comprises a set of special sounding frames sent by the transmitter (either the beamformer or the access point in the case of DL MU-MIMO), and a set of compressed V matrix frames returned by the beamformee. Because multiple clients are involved in MU-MIMO, a special protocol ensures they answer with feedback frames in sequence following the sounding frame. In 802.11ac, the protocol for generating CSI at the transmitter relies on sounding or null data packet (NDP) frames, together with announcement frames and response frames. First, the beamformer sends a null data packet announcement (NDPA) frame identifying the intended recipients and the format of the forthcoming sounding frame. This is followed by the sounding NDP itself, and the beamformee then responds with a beamforming report frame. The NDPA and NDP frames are quite simple. The NDPA identifies which stations should listen to the subsequent sounding frame, along with the dimensions of that frame depending on the number of antennas and spatial streams in use. The sounding frame itself is just a null data packet: It is the preamble with its LTFs that is of importance. The processing and construction of the beamforming report, however, is complicated. The beamformee measures the RF channel characteristics, then processes and returns the measurements as a compressed steering matrix to the beamformer. The calculations consist of a number of steps that are performed per-OFDM subcarrier. First, a matrix of the received signals is constructed, with magnitude and phase for each antenna combination (transmit and receive). Next, successive matrix multiplication operations (Givens rotations) make it invertible, the form of matrix required by the transmitter. Finally the parameters (angles) used in the matrix operations are assembled, along with some other power and phase figures, and the compressed matrix is returned to the beamformer. Even with this compression, a beamforming report can range from less than 1 KB to greater than 20 KB, as it contains information per-subcarrier for each space-time stream and depends on the number of spatial streams and transmit antennas in use. • It is a predefined 802.11n technique, it distributes computation among the receivers rather than placing the burden on the transmitter. • It is simple enough that the matrix algebra can be completed quickly for immediate feedback to the beamformer. • It provides considerable data compression for the beamforming report. • Where conditions are favorable, the calculation can be short-cut to further reduce the matrix size. Its accuracy is limited by the ‘quantization’ of the angles returned – with fewer bits per angle, the report frame shrinks but precision is lost. The parameters used in 802.11ac represent a compromise, allowing most of the theoretical beamforming gains to be realized with considerable savings in computation and feedback bandwidth. Thus 802.11ac, by standardizing and enforcing compliance with the sounding sequence and the format of the compressed V matrix feedback frame will enable widespread adoption of beamforming and DL MU-MIMO, as well as potentially enabling better MIMO SDM performance. Some of the most significant throughput gains of 802.11ac are from multi-user MIMO (MU-MIMO). This exploits the same phenomenon of spatial diversity multiplexing (SDM) used in 802.11n, where multiple antennas send separate streams of data independently, although the transmissions occupy the same time and frequency space. This MU-MIMO technique in 802.11ac is also referred to as spatial diversity multiple access (SDMA). support diverse paths, and how does a device know that another is transmitting so it can safely transmit to its partner at the same instant? 802.11ac solves these problems by simplifying them. It assumes that access points (APs) are different from client devices in that they are less space-, power-, and even price-constrained, so they are likely to have more transmitting antennas than client devices. Therefore, since the number of spatially diverse paths depends on the number of antennas, and the number of opportunities depends on the amount of traffic buffered for transmission, the AP is allowed to transmit to several clients simultaneously should it find an opportunity to do so. pair of devices are isolated. This downlink MU-MIMO (DL MU-MIMO) is the only configuration supported in 802.11ac. It precludes some other forms such as uplink MU-MIMO. Only one AP or client can transmit at any instant, and while the AP can transmit to multiple clients simultaneously, clients can only transmit to the AP one by one. the AP, and we usually expect clients to consume more data than they generate. the known simultaneous paths to its clients, the AP can make sure that it uses all opportunities for SDMA. in the explicit beamforming feedback frame. This is because MU-MIMO introduces a new dimension. While single-user MIMO is only concerned with how one client receives the AP signal, MU-MIMO throughput is limited by the interference caused when a signal aimed at one client bleeds over to another client. To counteract this effect, the AP calculates how much of the signal aimed at client A will be received at client B and/or client C, and uses beamforming techniques to steer a null onto the other clients, so they can successfully receive their own signals. MU-MIMO throughput is very sensitive to this selfinterference, and the beamforming feedback frame for MU-MIMO has higher precision for the matrix angles, and also includes SNR information to improve accuracy and allow interference to be minimized. Thus the data reported allows the AP to calculate the SDMA possibilities for different client groups, and the required steering matrices. This calculation is not part of the standard, but it is complex and there are several possible algorithms. Precoding algorithms for beamforming and DL MU-MIMO The most accurate way of precoding for MU-MIMO is known as dirty paper coding (DPC). An elegant theorem with an intuitive conclusion, DPC states that if the interference state of the RF channel is known exactly, there is a precoding profile that allows maximum data transfer through that channel, no matter what the pattern of interference may be. The analogy is to take a sheet of dirty paper, and write on it in such a way that the writing can be read. If the exact pattern of dirt is known, the writing can be made to stand out against it without the reader needing to know about the pattern. Similarly, if a transmitter has exact CSI, it can calculate DPC and achieve the theoretical maximum channel throughput without the receiver knowing CSI. Unfortunately DPC is a non-linear technique, which makes it difficult to apply in practice. Similar results, often nearly as good, can be achieved by approximating with linear techniques such as maximal likelihood transmission and zero-forcing. The former concentrates on steering signal maxima onto the intended receiver’s antenna while the latter steers nulls or zeros to the other recipients of the MU-MIMO transmission, allowing them to decode their desired signals with minimum interference. Further complicating the DL MU-MIMO precoding algorithm, the transmitter must choose which measure of throughput to maximize. With a single user, maximum data rate under a given error rate constraint would be the usual parameter, but with multiple users it is possible to weight each user’s throughput in the algorithm. Most systems just sum throughput over all users with equal weighting, but this can result in favoring high-rate connections at the expense of lower-rate clients, which may be undesirable, especially when quality of service (QoS) is considered. Scheduling DL MU-MIMO multiple-transmit opportunities When the precoding matrices are known, and good multi-user-groups identified, frames buffered for transmission must be grouped to ensure optimal throughput. The matching process becomes quite complicated, as the QoS enhancements originally from 802.11e require the AP to maintain four transmit buffer queues, one for each access category of traffic. 802.11ac takes this into consideration, explicitly allowing the AP to pull forward the transmission of lower-priority traffic, if a transmit opportunity (TXOP) was legitimately won for the primary frame to be transmitted. The traffic bundled with the primary frame may jump the queue and get transmitted before higher-priority frames, but these frames don’t suffer, as they would not have been able to use the TXOP with the primary frame. For an example of the power of properly-scheduled DL MU-MIMO, consider an AP with eight antennas serving a client with only one antenna. Normally, only a single stream will be practicable, and while some of the extra antennas on the AP can be used to improve the SNR (with beamforming, STBC, and MRC), much of the potential from the AP’ extra antennas will be wasted. transmission must use the same MCS. The 802.11ac amendment continues to extend the complexity of its modulation techniques. Building on the rates up to 64- quadrature-amplitude modulation (QAM) of 802.11n, it now extends to 256-QAM. This means that each RF symbol represents one of 256 possible combinations of amplitude (the signal power) versus phase (a shift from the phase of the reference signal). 16 possible amplitude levels and 16 phase shift increments – but increases the amount of information each symbol represents from 6 to 8 bits when comparing the top 802.11ac rate to 802.11n (before the coding of 5/6 is calculated, but this applies to both examples). While the 256-QAM 5/6 modulation provides a higher raw-data top speed, the table of available PHY rates is very long, as with 802.11n, to account for various other options. 2. Modulation and coding. All the earlier options are still available, and are used if SNR is too low to sustain the highest rates. But in the MCS table, the canon of 802.11n is extended to add 256-QAM options with coding of 3/4 and 5/6. 3. Guard interval. Unchanged from 802.11n, the long guard interval of 800 nsec is mandatory while the short guard interval of 400 nsec is an available option. The guard interval is the pause between transmitted RF symbols. It is necessary to avoid multipath reflections of one symbol from arriving late and interfering with the next symbol. Since light travels at about 0.3 meter/nsec, a guard interval of 400 nsec would work where the path taken by the longest reflection is no more than 120m longer than the shortest (often the direct) path. Experience with 802.11n shows that the 400 nsec option is generally safe to use for enterprise WLANs. Increased coding in terms of bits/sec per hertz of spectrum comes at a price: The required signal level for good reception increases with the complexity of modulation and the channel bandwidth. The graph below shows, for instance, that whereas -64 dBm was sufficient for the top rate (72 Mbps) of 802.11n in a 20-MHz channel, the requirement rises to -59 dBm for the top rate (86 Mbps) of 802.11ac, single-stream in a 20-MHz channel, and to -49 dBm for the top rate (866 Mbps) in a 160-MHz channel. Adjacent channel interference requirements also become more difficult to meet with the higher rates of 802.11ac. This trend was apparent with 802.11n, where using adjacent channels noticeably affects the SNR, and the 256-QAM 5/6 rate requires some 8 dB more adjacent channel isolation than the equivalent case for 802.11n. Modulation in 802.11ac is simplified compared with the original 802.11n, because equal modulation is now assumed (where multiple streams are used, they all have the same MCS modulation). It was theoretically possible in 802.11n for each spatial stream of a multistream transmission to use a different modulation, allowing some streams to use lower order modulation schemes depending on the SNR of the path. But unequal modulation was not included in Wi-Fi Alliance certifications, and current 802.11n devices don’t support it, so it was dropped for 802.11ac. Both the binary convolutional code (BCC) and low-density parity check (LDPC) methods of forward-error correction are defined for the new rates, as for 802.11n rates. The former is mandatory, while the latter is optional. While it is a relatively new technique, LDPC offers an improvement of around 2 dB over BCC at packet error rates of 10-2 for 1000 B packets. This worthwhile improvement can make the difference between moving to the next-higher order modulation rate (on the graph above), or alternatively, at the same modulation rate it can significantly reduce error packets. There are few MAC changes in 802.11ac that primarily introduce a faster PHY layer. But improvements are made in a number of areas. A client (or AP) must contend for the medium (a transmit opportunity on the air) with every frame it wishes to transmit. This results in contention, collisions on the medium and back-off delays that waste time that could be used to send traffic. 802.11n introduced mechanisms to aggregate frames and thus reduce the number of contention events. Many tests have shown the effectiveness of reducing contention events in prior 802.11 standards. For instance, in 802.11g, a given configuration can send 26 Mbps of data using 1,500-byte frames, but when the frame length is reduced to 256 bytes, generating 6x the number of frames, throughput drops to 12 Mbps. With MAC-layer aggregation, a station with a number of frames to send can opt to combine them into an aggregate frame (MAC MPDU). The resulting frame contains less header overhead than would be the case without aggregating, and because fewer, larger frames are sent, the contention time on the wireless medium is reduced. Two different mechanisms are provided for aggregation, known as Aggregated MSDU (A-MSDU) and AggregatedMPDU (A-MPDU). In the A-MSDU format, multiple frames from higher layers are combined and processed by the MAC layer as a single entity. Each original frame becomes a subframe within the aggregated MAC frame. Thus this method must be used for frames with the same source and destination, and only MSDUs of the same priority (access class, as in 802.11e) can be aggregated. An alternative method, A-MPDU format, allows concatenation of MPDUs into an aggregate MAC frame. Each individual MPDU is encrypted and decrypted separately, and is separated by an A-MPDU delimiter which is modified for 802.11ac to allow for longer frames. A-MPDU must be used with the block-acknowledgement function introduced in 802.11n. This allows a single ack frame to cover a range of received data frames. It is particularly useful for streaming video and other high-speed transmissions, but when a frame is corrupted or lost, there will be a delay before a non-acknowledge is received and re-transmission can be accomplished: this is not often a problem with broadcast video, where re-transmission is often not feasible, given the time constraints of the media, but may be problematic for other real-time applications. be a 5.484-msec limit for the time-on-the-air: at 300 Mbps, a 200 KB A-MPDU would take the maximum 5.484 msec on the air. performs well in the presence of errors due to its selective retransmission ability. A new encryption protocol, known as Galois Counter Mode Protocol (GCMP) is being introduced as for new, high-rate 802.11 applications. GCMP is defined as an option in 802.11ad, the 60-GHz-band amendment, and this forms the basis for its inclusion in the 802.11 baseline (in the next roll-up revision of 802.11) and its availability for 802.11ac. GCMP is a good addition to the standard because it has better performance than CCMP, the current encryption protocol. Both protocols are block encryption ciphers that offer confidentiality so hackers cannot decrypt the data, authentication to ensure it comes from the authenticated peer, integrity so it can be decrypted, and replay protection so that old or doctored messages retransmitted by a hacker are rejected by the recipient. Both use keys of 128 bits and generate the same 24-bytes-per-frame packet format and overhead. But GCMP requires only one pass to encrypt a given data block, and can encrypt and decrypt blocks in parallel. This improves on CCMP where two sets of calculations are required to encrypt a block, and each data block in a session must be processed in sequence, as the result of one block is used as an input to the next. This means GCMP is better suited to very high-rate data encryption and decryption. GCMP is expected to be phased in over several years. Silicon will need to be redesigned, for both clients and APs, so CCMP and GCMP will overlap in practical networks for a long while. (reference 802.11-10/0438r2) or earlier is not clear today. It is possible that GCMP will never be required for 802.11, and that we will never see practical implementations, but it is established as a new option if required. Many 802.11 devices are still battery-powered, and although other components of a smartphone, notably the display still tax the battery much more than the Wi-Fi subsystem, power-saving additions are still worthwhile. not then transmit a frame for that client. Similarly, if a TXOP is truncated by the AP, it must remember that certain clients will still be dozing and not send new frames to them. To allow clients to quickly identify if a frame is addressed to them, a new field called partial association ID (partial AID) or Group ID for MU-MIMO is added to the preamble. If the partial AID field is not its own address, the client can doze for the remainder of the TXOP. One reason to introduce VHT TXOP power save is that the frames are getting longer. 802.11ac has extended frame lengths and now allows for frames approaching 8 KB in length, and aggregated frames (A-MPDU) to 1 MB. Some of this is accounted for by the increased rates, so time on the medium will not be extended pro-rata, but video and large file transfers, two of the more important use cases, drive large numbers of long frames (possibly aggregated as A-MSDU or A-MPDU frames at the Wi-Fi layer) so it may well be worthwhile switching off a radio while large numbers of frames are being delivered to other clients. The other major power-saving feature of 802.11ac is its high data rates. Power consumption in 802.11 is heavily dependent on the time spent transmitting data, and the higher the rate, the shorter the transmission burst. The time spent receiving frames is also reduced by high rates, but not so significantly. Other features, like beamforming contribute to higher rates by increasing the SNR at the receiver for any given scenario, so they can also be said to contribute to better battery life. And general silicon advances in feature miniaturization and power-save techniques will all be adopted in new chips implementing 802.11ac. 802.11 already defines a load element that allows the AP to advertise its current load in the beacon and probe responses. The load element includes the number of clients on the AP, and also a measure of channel utilization. This is useful for client-initiated load balancing. When a client sees a number of APs, it can choose to associate with one with fewer clients or lower channel utilization, as that AP may offer better performance. It also offers a form of soft call admissions control: if an application can signal its bandwidth requirements to the Wi-Fi chip, it can avoid associating with APs with insufficient bandwidth. MU-MIMO introduces another dimension to AP load. It is not sufficient to indicate channel utilization, so an extended load element includes information about the number of multiuser-capable clients, the underutilization of spatial streams in its primary channel, as well as utilization in wider 40, 80 and 160-MHz channels, if applicable. An 802.11ac client, reading the extended load element, can make a more informed decision about which AP to choose for association. to older APs, is a good neighbour. 802.11ac has a number of features for co-existence, but the main one is an extension of an 802.11n technique: A multipart RF header that is uses 802.11a and 802.11n modulation. Non-802.11ac equipment can read these headers and identify that the channel will be occupied for a given time, and therefore can avoid transmitting simultaneously with the very high throughput frame. Although 802.11n defines a greenfield mode for nonbackwards-compatible operation, it has never been implemented in practical networks and all 802.11ac APs are expected to run in mixed mode. The main differences between 802.11n and 802.11ac are the new, wider channels used. If an 802.11ac device started transmitting in 80 MHz, older 802.11 stations in the vicinity would not be able to recognize the transmissions or decode them. Adding an 802.11n-like preamble solves this problem. But the stipulation that 802.11ac operates only in the 5-GHz band, not at 2.4 GHz, makes it easier, as only 802.11a and 802.11n need to be accounted for as legacy, not 802.11b. The 802.11ac preamble includes a number of training fields. It starts with L-STF, L-LTF and L-SIG, respectively the legacy short training field, long training field and signal field. To allow for a wide channel, for instance 80 MHz, overlaying a neighbouring 20-MHz channel, it is necessary to transmit training fields in all possible channels. But with the wonders of OFDM, this can be done simultaneously in the same time slot so the frame does not become over-lengthy. The L-STF and L-LTF allow the receiver to synchronize with the signal, so the rest of it can be correctly decoded. The final part of the legacy preamble, the SIG, includes information on the length of the frame. This is the part that allows legacy stations to set their network allocation vector (NAV), part of the existing medium access protocol. Following the legacy preamble is the very high throughput (VHT) preamble. This again consists of STF, LTF and SIG sequences, but modulated in the particular channel being used by the AP. is transmitted as 20-MHz symbols, replicated over all underlying 20-MHz channels. VHT-LTF fields are next, one per spatial stream to be used for transmission. LTF fields allow the receiver to calculate the multipath characteristics of the channel and apply them to the MIMO algorithm. Finally a second VHT-SIG-B is transmitted. This includes the length of the frame and more information about the distribution of spatial streams if MU-MIMO is to be used. There are various references in the IEEE document to “apply phase rotation for each 20-MHz sub-band”. This is a technique to avoid a high peak power in the transmitter. By rotating the phase per sub-band, the peak power output is reduced. The technique is already used in 802.11n 40-MHz channels. When an AP is configured for 802.11ac and hence using an 80 or 160-MHz channel, it can act as an AP in 20-MHz channels by using non-HT duplicate mode. This allows it to transmit the same frame on several channels simultaneously. Protection, dynamic bandwidth and channelization When an 80-MHz 802.11ac network operates in the neighbourhood of an older AP, or a network that’s only using a 20-MHz or 40-MHz channel, it must avoid transmitting simultaneously with a station in the neighbouring network. The answer is in three parts. How can a station (AP or client) that wants to operate at 80 MHz, warn older stations to stay off the air while it is transmitting in 802.11ac mode, which they can’t decode? Then, how does the 802.11ac station know that the full channel is clear of other stations’ transmissions? And finally, how can bandwidth usage be optimized if, for instance, an older station is transmitting in just 20 MHz of the 80-MHz 802.11ac channel? Sending a warning to other stations to stay off the air is achieved by RTS frames. The 802.11ac station sends out multiple parallel RTS protection frames in each 20 MHz of its 80-MHz channel, at rates an 802.11a or n client can understand. The multiple RTS frames use duplicate, quadruplicate or octuplicate transmission. Before sending RTS, it performs clear channel assessment (CCA) to make sure it can’t hear any transmissions in progress. On receiving the RTS frame, older stations know how long to wait for the 802.11ac transmission. Next, the recipient runs a clear channel assessment in each of the 20-MHz channels. The RTS frame format is extended so the originator can indicate its channel options and replies with a CTS response to indicate whether it hears transmissions in progress from any neighboring network. If not, the originator transmits the data frame using the full bandwidth – 80 MHz in this case. However, if the recipient does find transmissions in progress on any secondary channel, it can continue responding with CTS but indicating which primary channels are clear (20 MHz or 40 MHz), then the originator can send its transmission using only the usable part of the 80-MHz channel. This may force a reduction in channel from 80 MHz to 40 or even 20 MHz, but the frame will be transmitted using air-time that would otherwise be unused. This feature is called dynamic bandwidth operation. The alternative to dynamic bandwidth operation is static bandwidth operation. If this is used, the recipient has only one choice to make. If the whole channel – 80 MHz in this case – is clear, it proceeds with CTS, but if any part of the channel is busy, it does not respond and the originator must start again with a new RTS frame. Dynamic bandwidth optimization is constrained by 802.11ac’s definitions of primary and secondary channels. For each channel, such as an 80-MHz channel, one 20-MHz channel (sub-channel) is designated as primary. This is carried through from 802.11n, and in networks with a mix of 802.11ac and older clients, all management frames are transmitted in this channel so all clients can receive them. The second part of the 40MHz channel is called the secondary 20-MHz channel. And the 40-MHz of the wide channel that does not contain the primary 20-MHz channel is the secondary 40-MHz channel. Data transmissions can be in the primary 20-MHz channel, the 40-MHz channel including the primary 20-MHz channel, or the full 80-MHz channel, but not in other channel combinations. Finally, the introduction of wideband channels, especially the 80 + 80-MHz channels, requires some changes to the channel switch announcement (CSA) frame. CSA is used by an AP to inform its associated clients when it is about to switch channels after radar has been detected in the current channel: it was first introduced in 802.11h as part of DFS. 802.11ac is not the only very high throughput (VHT) protocol making its way through the IEEE 802.11 standards process. The 802.11ad task group is just finishing its work, scheduled for completion in December 2012. 802.11ad uses the 60-GHz band, a globally-available spectrum. The standard includes four defined channels of 2.16 GHz, from 57-66 GHz. Only three can be used in the U.S.
but the fourth is available in most other countries. Because of the very large channel width, PHY rates are defined up to 4.6 Gbps for single carrier (SC) and 7 Gbps for OFDM modulation. While 802.11ad is indeed very high throughput, it is also short-range. Generally we expect a range of about 10 meters, and even that will require beamforming with high-gain (13 dB+) antennas. The use of high-gain antennas and beamforming requires a node discovery protocol. Since some nodes won’t be able to hear each other with an omni antenna pattern, but high-gain antennas are directional, the idea is that each node in turn sweeps through different sectors with its antenna, pointing a beam on different arcs until it has swept a complete circle. Once two nodes have discovered each other in this way, they can optimize their beamforming parameters in a fine-tuning mode. These techniques are interesting because they may be applicable, eventually, to 802.11ac if beamforming is used to extend range. At both the PHY and MAC layers, 802.11ad is very different from other 802.11 standards. This is because different techniques are applicable for 60 GHz, and also because the standard has its origins in the WiGig industry group. However, the standard is careful to use the same higher-level architecture as 802.11, to maintain the 802.11 user experience, including the concept of an AP and basic service set (BSS), authentication and security. This enables a feature of 802.11ad that directly affects 802.11ac called fast session transfer (FST) or multiband operation. FST allows a pair of devices carrying a session to switch the connection seamlessly from a 60-GHz (802.11ad) link to an 802.11ac link at 5 GHz and vice versa. There are several options in FST, depending on whether the interfaces have the same MAC address and common MAC management layers for the two links, in which case the switch can be completely transparent, or different MAC interfaces and addresses, which are more complicated (non-transparent) and slower. Also, some devices will be able to maintain simultaneous links in the two bands while others will not. FST is important because it allows home networks to be built from a combination of 802.11ac and 802.11ad devices. Short-range, high-rate communication across rooms will be handled by 60-GHz links, but if there are marginal conditions, the switch to 5-GHz is fast, and handled by lower protocol layers. More complex networks can use a tunnel mode where packets from one type of connection can be forwarded on a second link. Consumer electronics manufacturers are implementing both 802.11ac and 802.11ad to enable fully wireless home multimedia networks. Most observers agree that the 802.11ac amendment has, thus far, moved faster and more smoothly than the original 802.11n. This is partly due to the evolutionary nature of the amendment. It essentially uses the same techniques as 802.11n, but extends rather than synthesizes the whole MIMO structure from scratch. The IEEE also made a conscious decision to change the process. where companies formed ad-hoc alliances and sought to deliver fully-formed specification documents to the IEEE task group as the initial proposal. The result was that voting members whose proposals were down-selected and were not part of the winning consortium tended to view the whole proposal as alien, resulting in continued opposition all the way to sponsor ballot stage. The new format has allowed more of the specification to be written from consensus, and this should continue to pay off in smoother passage through ratification. Thus far, Wi-Fi has done an excellent job of creating an effectively global standard. A PC or other client device can move from continent to continent and receive consistent service, as far as the consumer is concerned. Below the surface, there are national differences concerning allowed channels and power levels, but these are accommodated in the 802.11 standard and are not significant enough to affect performance. However, 802.11ac uses the 5-GHz spectrum, which is not quite unified globally, and as the channel width increases to 80 and 160 MHz, differences between national regulations will become more important. multipath that multi-stream connections offer good throughput gains nearly all the time. Secondly, 40-MHz channels are very useful in the 5-GHz band. Most current enterprise WLANs use 20-MHz channels at 2.4-GHz and 40-MHz channels at 5-GHz with dual-radio APs. The only exception is that with very high user or device density, higher overall throughput is achieved by loadbalancing clients across many 20-MHz channels rather than a smaller number of 40-MHz channels. The next significant success is from MAC frame aggregation, A-MPDU. The ability to contend once to get on the air, then send multiple frames back to back is very helpful for highrate traffic, chiefly video, which is usually responsible for high bandwidth utilization. Where high loads are due to mediumrate traffic from many clients, rather than high-rate traffic from just a few clients, A-MPDU is less effective, but the latter is the more prevalent case. Several 802.11n features have not yet been widely deployed. The most disappointing is beamforming. While several chip vendors implemented implicit beamforming, most gains from it are only realized with accurate receiver feedback, and while it is in the standard, explicit beamforming between different vendors’ equipment is not yet a reality. 802.11ac streamlines the explicit beamforming section, removing many options, and requires explicit feedback for MU-MIMO, and we hope this will spur vendors’ implementation plans. In its development and adoption cycle, 802.11n has quickly become the industry standard for enterprise and consumer equipment. Nearly all 802.11 equipment now uses 802.11n silicon, a sign that chip vendors are putting all their development efforts into 802.11n. Even single-antenna, highly cost-sensitive devices like smartphones now use 802.11n, because innovations in low-power operation and large-scale production make them cost-effective with older technology. few years these will become more cost-effective for equipment vendors. 802.11ac will become the mainstream Wi-Fi technology, but there is likely to be a wider spectrum of chip options for residential and enterprise use and between client devices and APs. 80-MHz channels should be widely used in residential networks. The home Wi-Fi environment tends to revolve around a single AP, with relatively little high-power interference from neighbouring networks, so the low number of 80-MHz channels shouldn’t be an issue. In enterprise networks, the five available 80-MHz channels, of which three require DFS, should be sufficient for overlapping APs to provide contiguous coverage. Three-channel plans have been used in the 2.4GHz band for years, although some networks will have reasons to prefer a higher number of smaller-width channels. Although the widespread adoption of 160-MHz channels is unlikely, special applications that use this option will likely emerge. We can also count the antennas. The most significant leap for 802.11n was to MIMO with two or three driven antennas and two spatial streams. This happened right at the beginning, with the first wave of 802.11n equipment. Subsequent progress was slower. step increases in capability, implementation is slower and more gradual. translate immediately into increased complexity, cost, size and power consumption. But when new applications demand higher performance, the standards will be ready. The obvious new bandwidth-hungry application is residential video. Driving uncompressed or lightly compressed TV signals over wireless rather than cables is within the reach of 802.11ac, and depending on the relative success of 802.11ad at 60 GHz, it may prove to be an enormous market for the technology. Even without a significant new application area, existing uses and users of 802.11n require more speed. As enterprises, schools and universities, conference centres and hotels are seeing more high-bandwidth demand, especially for video and for high-density areas. Here the MU-MIMO features will allow a single AP to serve many clients, and we may see super-size APs with many more antennas, developed especially for such areas. Explicit beamforming is the one significant feature of 802.11n that did not live up to its promise. This is widely thought to be due to the breadth of implementation options and the preference of each chip developer for their own algorithm, but regardless of the reason there is hope that the simpler standard in 802.11ac will drive stronger adoption. 802.11ac takes all the techniques the Wi-Fi industry has learned up to 802.11n, and extends them. It is relatively uncontroversial to say that in a few years, Wi-Fi will be synonymous with 802.11ac, or whichever name the Wi-Fi Alliance chooses for it. The significant improvements are from wider channels, higher-rate modulation and higher-level MIMO, all evolutionary except the MU-MIMO option, but together they offer a top speed that is 10 times that of 802.11n. At this stage it is difficult to see a single device using all the options in the standard, but that is not the point, as Wi-Fi is branching in different directions and no doubt there will be applications for all of these new options. The Wi-Fi Alliance is under-reported in this paper because its work takes place a little later than the IEEE, selecting parts of the standard and developing from them an interoperability certification. But it plays a crucial role, as developers will build equipment to the eventual Wi-Fi Alliance certification rather than the IEEE standard. In the same way as 802.11n certification rolled out in two phases, 802.11ac will generate at least two Wi-Fi Alliance certifications over time. In residential settings, we expect 802.11ac to accelerate the home multimedia network, as it will have the bandwidth to support multiple simultaneous video streams. We expect to see TV monitors fitted with Wi-Fi connections, along with many other home media devices. Features that improve SNR, chiefly beamforming should extend the range of 802.11ac Wi-Fi and reduce coverage dead spots. It is difficult to quantify these improvements, but they could be as much as 30% greater useful range. In enterprise networks, the higher rates and increased capacity of 802.11ac will break down the last remaining barriers to the all-wireless office. There should be enough capacity in an 802.11ac WLAN that users see equivalent performance to wired Ethernet. We are already seeing applications such as wireless display projection from PCs to monitors and displays becoming popular in niches such as education, and with the increase in rates from 802.11n to 802.11ac that is bound to continue. While beamforming will extend range in enterprises as in residential WLANs, the higher user density and slowly upgrading device base means it is unlikely AP distances will be increased substantially, except in specific cases. before chips and devices catch up with all the features in the standard, and by that time there will no doubt be many new developments signaling where the next wave of innovation should be directed.